Fatalities from terrorism are at a record high now with just two groups, Boko Haram and Islamic State responsible for half of them, a new report showed. The Nigerian militants kill more people than their Iraqi-Syrian allies. 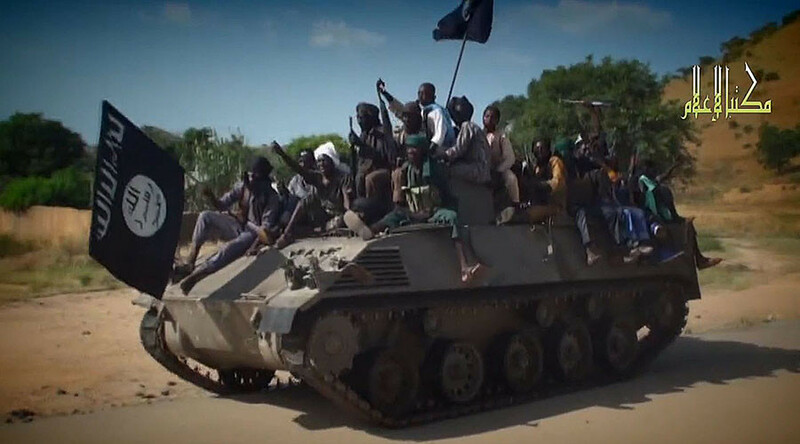 Two terrorist groups were responsible for over a half of the killings in 2014 – Nigeria-based Boko Haram and Islamic State (IS, formerly ISIS), which aims to expand its influence from the powerbase in Iraq and Syria globally. Together they were responsible for 51 percent of all global fatalities in 2014 claimed by any group, and almost 40 percent of all fatalities, according to the Global Terrorism Index published by the Institute for Economic and Peace (IEP). The Nigerian jihadists, who pledged allegiance to IS in March 2015, killed more people than their fellow Islamists, claiming 6,644 lives compared to 6,073. Nigeria accordingly experienced a staggering 300 percent rise in terrorism deaths in 2014, although other militant groups take partial blame for the increase. In particular the Fulani militants killed 1,229 in Nigeria. IS killed more people in combat than in acts of terrorism in 2014. It was responsible for at least 20,000 battlefield deaths over the year in clashes with various state and non-state combatants. The Taliban, which was the deadliest group in 2013, was ranked third in 2014, despite killing 3,477 people in terrorist attacks, which is a 38 percent increase in fatalities. The group remains second-deadliest after IS in terms of battlefield kills, the report says. 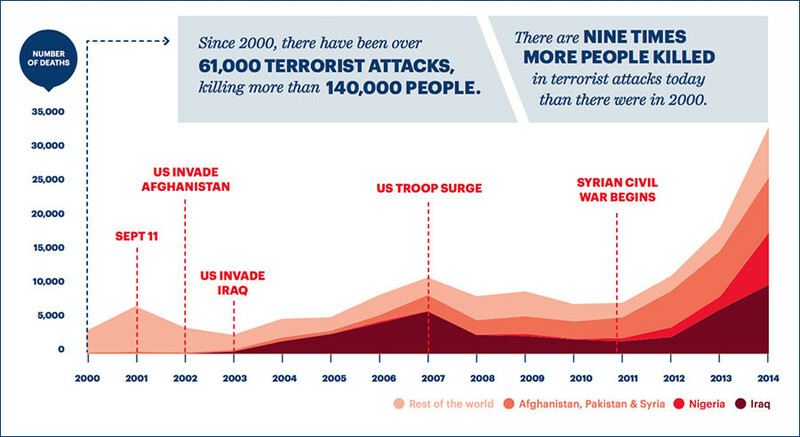 Compared to previous year, the number of deaths from terrorism worldwide has increased by 80 percent in 2014. Over the last year 32,658 people killed, compared to 18,111 in 2013. It’s the largest number recorded and is almost ten times higher than in 2000, when 3,329 people were killed by terrorists. Just five countries suffer the bulk of terrorist acts – Iraq, Nigeria, Afghanistan, Pakistan and Syria – accounting for 78 percent of all fatalities in 2014. Iraq bears the heaviest burden with 9,929 terrorist fatalities in 2014. The threat is spreading. The number of countries experiencing more than 500 terrorism-related deaths rose from five to 11 in 2014 with the addition of Somalia, Ukraine, Yemen, Central African Republic, South Sudan and Cameroon. The report doesn’t include this year’s terrorist attacks like the gun violence in France, the bombing of the Russian plane in Egypt, the high-profile bombings in Lebanon and Turkey and other incidents that reflect the growing threat of terrorism. In addition to loss of lives terrorism takes a heavy economic toll on affected countries. IEP says conservative estimates of damage from terrorist activity in 2014 stands at $52.9 million, a 61 percent increase from the previous year and a 10-fold increase since 2000. Battling terrorism remains more costly than the direct damage caused by it, the report said. An estimated $117 billion was spent globally to provide national security from terrorism threats. Western countries remain relatively safe from terrorism. In the last 15 years 2.6 percent of all terrorism-related fatalities happened in the West and the percentage drops to 0.5 if the September 2001 attacks in the US are excluded. ‘Lone wolf’ attacks account for 70 percent of all terrorist deaths in the West since 2006 and 80 percent of those deaths can be attributed to right-wing extremism, nationalism, supremacism, anti-government extremism and other types of political ideologies rather than Islamic fundamentalism. Despite the alarming trends terrorism remains a relatively small threat to lives, the report points out. Globally 13 times as many people are killed by homicides than die in terrorist attacks.